Over the last few weeks, AdWords has been slowly rolling out campaign drafts and several of the accounts I manage now have that feature as an option. AdWords campaign drafts will enable you to test the impact of changes you are considering with a traffic split in experiment mode, so that you can easily view the impact on your data before fully committing to a change that could have a negative implication. To locate drafts, click into one of your campaigns and you’ll see a new “Drafts” button next to the date range widget. Click on the drop-down and choose to create a new draft. Once you have named your draft, you’ll be taken to a mirror campaign mode, where you can make changes you’re looking to test just like you would in a regular campaign. For example, you may want to switch from manual bidding to Conversion Optimizer CPA bidding or you could test the impact of raising mobile bids. Once you’ve edited your draft campaign, click on the “Apply” button on the top right of the screen next to the dates and choose the run this as an experiment. Choose your experiment settings, including experiment split, which is the percentage of your campaign’s budget that’s allocated to your experiment. You’ll be able to check in on this experiment and how it’s performing in your campaign management page by clicking on “All experiments” just above the shared library link on the bottom left. Here’s a snapshot of what it looks like when you have an experiment in progress. 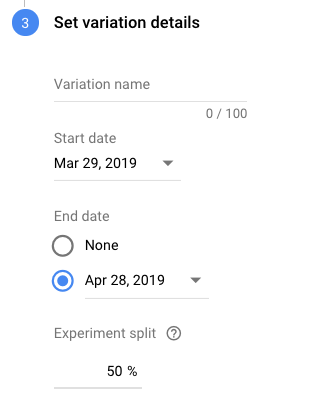 Not only can you see the differences between performances in your original campaign and experiment mode (indicated with up or down arrows), but Google also shows you if a difference is statistically significant or likely not due to chance. If the changes you have been testing are having a positive impact, you can apply them and choose to either update your original campaign or create a new campaign. This entry was posted in Google AdWords, PPC, ROI and tagged adwords campaign drafts, adwords drafts, adwords experiments, campaign drafts on March 11, 2016 by kristina. There is a new “Parental status” target option that rolled out in AdWords, which helps you target parents versus those who are not. This is a useful feature for advertisers who have demographic data on their customers and already know that their audience falls into a clear bucket. For example, those selling baby products or children’s clothes would benefit from it, as the majority of their customers are parents. Google determines parental status by monitoring browsing activity of sites you visit as as well as demographic data you may have shared in your Google profile or with similar sites. For example, if you browse mommy blog posts and read child development articles, Google may classify you in the “Parent” group. To see this option, navigate to your Display Network tab and select the Parental status sub-tab. Parental status is only available in display campaigns, and of course for a good number of users the information will be unknown. One way you can use this option is to exclude non-parents, for example. Be careful to review your performance metrics first before completely excluding an entire subset of your visitors. Because parental status is unknown for a large number of visitors, you may be excluding some valuable traffic. Another way to utilize this feature is with bid adjustments to increase or decrease bids. For example, if you already know that a good number of your converting customers are parents, bid more on that group, and decrease your bids on non-parents. Parental status started by being rolled out to US advertisers, and it may not be available in all countries just yet. This entry was posted in Display, Google AdWords, PPC, ROI and tagged parental status, parental status adwords, parental status google on July 18, 2014 by kristina. What Are Mobile App Campaigns? Imagine you’re selling a fitness product that helps people lose weight and be healthy. Your target customers are probably already looking into fitness solutions and programs. Many of them are using mobile apps to log their calories or track daily activity, or apps that help with nutrition. Now imagine being able to promote your product to someone who’s logging their daily food intake on their mobile app. You can do that easily through Google AdWords with a “Mobile apps” campaign type. Mobile apps is a strategy that allows you to show text and image ads on the Display Network to mobile device users. Your ads show within an app as potential customers use apps on their mobile devices. You can select app categories to show ads on, or you can research and choose specific apps that you already have in mind. 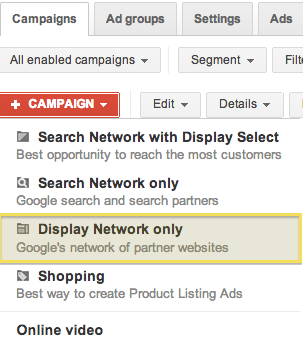 To get started, create a new campaign, choosing “Display Network only” as your campaign type. Choose your target countries, languages, set a budget, bids, and customize your other campaign settings. Next, you’ll get to choose your targeting. You’ll have the option to select specific “Mobile app categories” or “Search all apps” to choose specific apps. You can narrow your targeting further by age or gender to only show ads to specific age groups or only to women, for example, if that is your target audience. 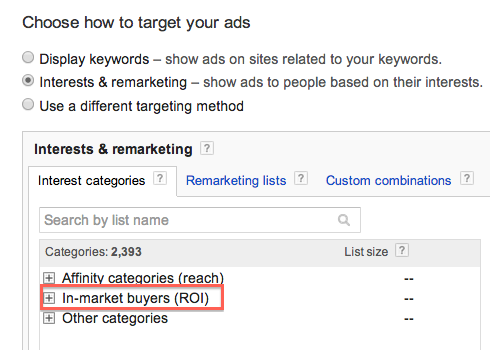 Or, you can refine targeting with interests and remarketing categories. For example, you can show ads to customers using apps that have been to your website before but did not convert. Once you have chosen your targets, create ads and your campaign is ready to run! This entry was posted in Google AdWords, Mobile Ads, PPC and tagged mobile app campaign, mobile app campaigns, mobile apps, mobile campaign on April 5, 2014 by kristina. With Google’s recent announcement that ad rank is now factoring ad extensions, it is now more than ever vital to incorporate any relevant enhancements to your ads, such as sitelinks and call extensions. One of the more recent additions to the ad extensions menu are Review Extensions, which allow you to highlight reputable third party reviews and accolades. They can help you entice users to clicks on your ads by highlighting an endorsement and help expand your ad with additional real estate. If you’ve got some praise, why not flaunt it? Reviews appear below your ad description in top ranked ads and link to the review source, such as a magazine article. If a user clicks on your review extension, you won’t be charged for a click that’s going to your review source, unless this user clicks on your ad as well. Just like with sitelinks, you can set-up review extensions at the campaign or at the ad group level. When you’re choosing your review extension text, make sure that it is not too similar to your ad copy and potentially redundant. Use that space to communicate what someone else raved about and make sure you are accurately representing the original source. To get started with review extensions, log-in to your AdWords account and go to tab Campaigns. 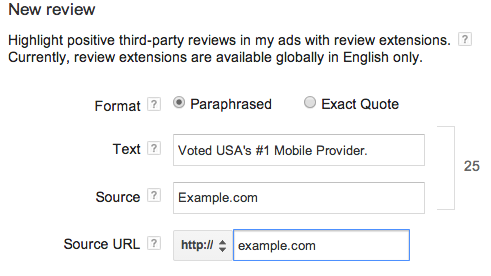 Go into a specific campaign, click on tab Ad Extensions and choose Review Extensions from the drop down. Click on +Extension to create a new review extension. You can either use an exact quote from your source or you can paraphrase text. Make sure to state your source in the Source field and link to the third-party URL — your review source cannot be your own website. -Your review should not be about a specific product or service, but about your business as whole. It should also not be just a description of your business. -The review also needs to be less than a year old. -Individual customer reviews and testimonials are not accepted. -Aggregate reviews and rating from websites like Yelp.com are not allowed. -Press releases cannot be used. -Currently, review extensions are only available in English. -Do not repeat your business name in the review – one review extension I created was disapproved for this reason. -Use … ellipses to show missing words or phrases. You can find the full list of requirements and restrictions here. There has been quite a bit of confusion with what counts are “reputable” with some seemingly prominent websites getting disapproved. Make sure to check on your review extensions to see if it’s been approved. If you notice that it’s been disapproved, get in touch with AdWords support to find out why, as no disapproval reason is currently listed in the AdWords interface. Just like with other ad extensions, your review extensions won’t show every time a user is searching. You can review impressions and other performance metrics in the Ad Extensions tab by choosing the Review Extensions drop down. This entry was posted in Ad Text Optimization, Google AdWords, PPC and tagged review extensions on January 19, 2014 by kristina. Are you considering changing your AdWords bids but are worried about making the wrong choice? Wondering what would happen if you increased your bid from, say $1 to $1.20, and what difference it would make? Adjusting bids based on traffic and conversion patterns is essential to optimizing your PPC campaigns, and all successful advertisers modify their Max CPCs regularly to reach their goals. AdWords has for some time now provided data on the impact of bid changes on impressions and clicks, but what anyone tracking conversions really wants to know is what the impact will be on sales or leads. AdWords advertisers can now make some more educated guesses using Google’s updated bid simulator. The bid simulator works with your Search campaigns only by analyzing data over the past 7 days, taking into account information like your competitors’ bids and traffic you received. It then estimates how results might have differed if you used a lower or a higher bid. For example, you can estimate how many more clicks and conversions you might have received if your bid was 10% higher. If you track conversion values, the tool will also include that metric. If your campaigns are limited by budget, the tool will not be available and it will also not work with auto bidding or Conversion Optimizer (CPA Bidding). You can find the bid simulator at the ad group or at the keyword level. 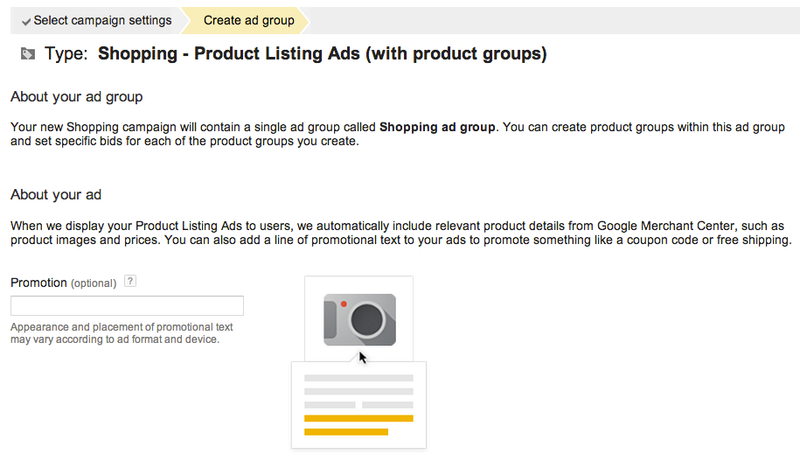 In your AdWords account, go to your Campaigns tab and navigate to an ad group. Hover over the Bid Simulator graph icon below your Max CPC bid and click on it to bring up the tool and explore the different bid options. Google will provide some metrics based on a variety of Max CPCs you could choose, or you can enter a different Max CPC you are considering by clicking on Use a different bid. Compare the current bid metrics to what your results would look like if you used a different bid and decide if the change in bid makes sense for you. For example, if after increasing the bd, the cost would go up significantly without a high enough change in conversions or conversion value, you might want to leave the current bid as is. Keep in mind that the estimates you are seeing are just estimates and future results will vary, as search patterns are constantly changing and do vary week over week. Your competition is likely changing their bids as well on an ongoing basis. Make sure to explore the available data when considering changes to your campaigns. If you do adjust bids, continue to monitor your conversion numbers, especially budget and ad spend if you increased your bids significantly. This entry was posted in AdWords Conversion Tracking, Google AdWords, PPC, ROI and tagged bid simulator, google bid simulator on December 8, 2013 by kristina. Do you sell a large number of products that are becoming difficult to manage in Google AdWords? If so, you might benefit from Google’s Dynamic Search Ads, a campaign type that helps automate the keyword and ad creation process. Dynamic Search Ads automatically matches up user queries to relevant pages on your website based on your website content. Each headline and Destination URL is customized to match the keyword a user is searching on. 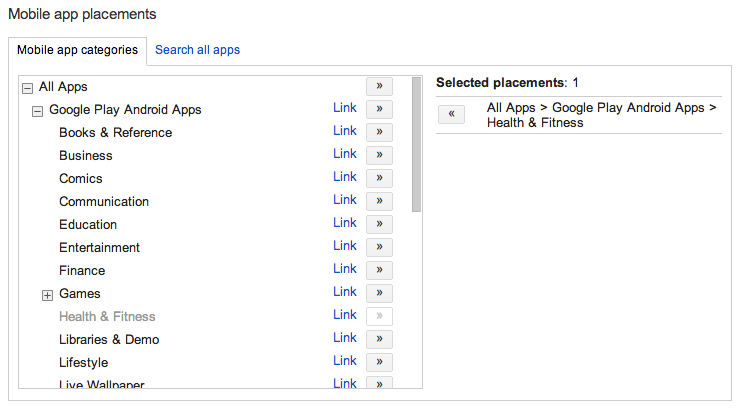 To get started, click on + Campaign in your AdWords account and choose option Search Network only. On the next step, select campaign type Dynamic Search Ads and fill in your target settings, including desired locations, budget, and default bid. Under Ad extensions, make sure setting Use my website content to target my ads is checked, enter your website domain, and choose your website language. Next, you’ll create your first ad group and write a dynamic ad. You just need to write default description lines — AdWords will automatically fill in the Headline and Destination URL based on each query. Under Auto targets, check All pages to include your entire website. It’s a good best practice to start with an “All pages’ ad group and create additional, more targeted category ad groups to refine your ads and bids within Dynamic Search Ads. My recommendation is to run Dynamic Search ads in parallel with your standard search campaigns. While the campaign is largely automated, it does require some optimization. For example, review and adjust your bids based on performance, and make sure to exclude irrelevant queries by reviewing the search term reports. Continue to experiment with ad description lines and rotate multiple ads within each dynamic ad group to find text that works better. Finally, Dynamic Search Ads may not work for all types of websites. It’s a campaign type well suited for larger websites with more than 20 pages. This entry was posted in Account Structure, Ad Text Optimization, Google AdWords, Keyword Optimization, PPC, ROI and tagged dynamic search, Dynamic Search Ads on November 15, 2013 by kristina. Google’s new Shopping campaigns have launched to a limited number of AdWords advertisers. With the new Shopping campaigns, Google is looking to streamline product campaign and bid management as well as reporting, all a big need with the old Product Listing Ads (PLA) campaigns. Everything looks pretty similar to what you may have seen when creating other campaign types, through there is a new Shopping channel option, where you can select to show products from your online site, local stores, or both. Once you have chosen your basic campaign settings, you’ll have the option to create a promotion. After creating a promotion, you’ll be taken to your Product groups, which will have your All products group and the option to add additional targets. 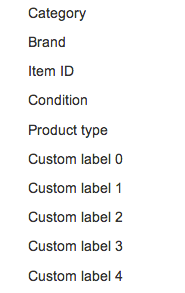 Clicking on the + sign will take you to a screen where you’ll be able to select product categories as well as more granular targets such as product type, brand, item ID , condition, and more to allow you to bid on each target based on how profitable it is, for example. You can also exclude a product type from triggering ads. One interesting feature that you can locate in your Shopping campaign settings is Campaign priority. 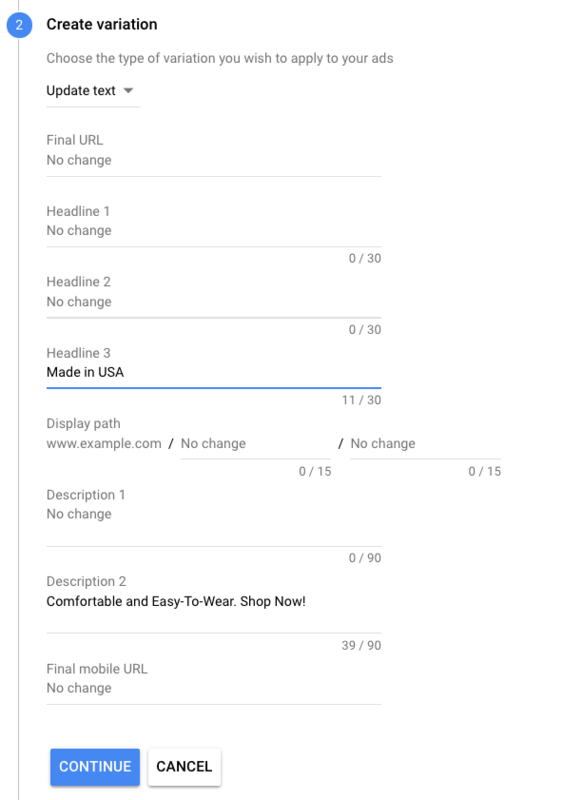 The default setting is Low, but if you set it higher, Google will prioritize this campaign if you happen to have the same product in another PLA campaign. 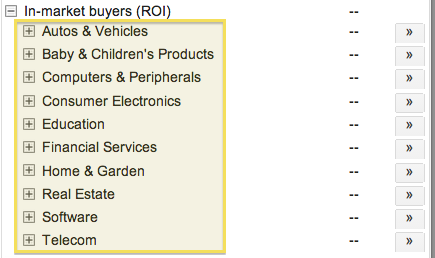 Generally, your bid is what determines which ad will show, unless you set your Shopping campaign to a higher priority. Additionally, Shopping campaigns will provide competitive benchmarks, such as impression share, and a bid simulator that will help you optimize bids and budget based on competition. 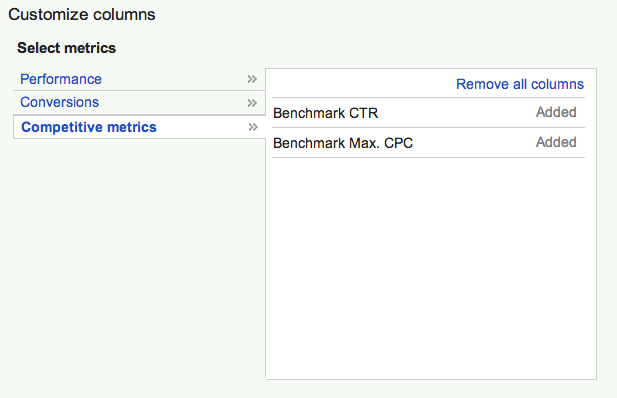 Make sure to customize your columns to include Competitive metrics. Shopping campaigns will eventually replace PLA campaigns so make sure you familiarize yourself with these new features that can help you run more profitable campaigns. If you have any questions, feel free to contact me. This entry was posted in Account Structure, Google AdWords, PPC, Shopping and tagged adwords shopping, google shopping, product listing ads, shopping campaign, shopping campaigns on October 29, 2013 by kristina.